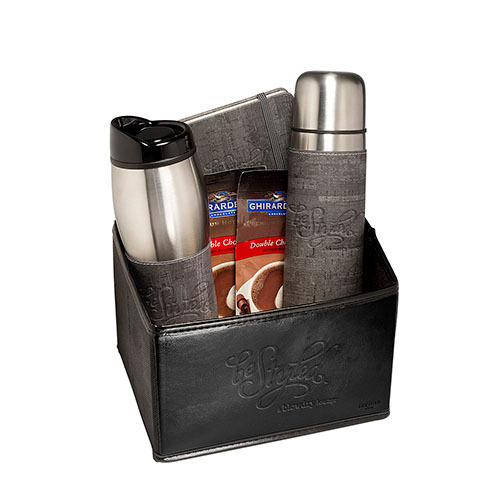 Includes the Casablanca Thermos, the Casablanca Tumbler, the Casablanca Journal, the Venezia™ Folding Bin and two packets of Ghirardelli® Premium Hot Cocoa Mix. 16.9 oz.stainless steel thermal bottle with cork textured sleeve with natural weathered look and stainless steel, leak-proof cap keeps drinks hot or cold for hours. Cups are 10 oz. 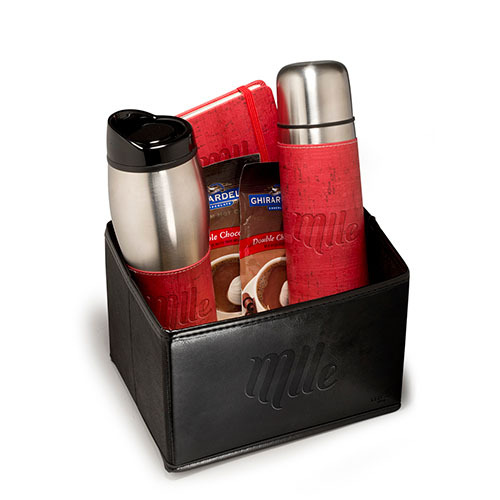 double-wall stainless steel with cork textured sleeve with natural weathered look, heat-resistant polypropylene handle. Journal features simulated cork textured cover with natural weathered look, 80 ruled pages, elastic loop closure and bookmark with document pocket on inside back cover. Collapsible bin made of glazed faux leather and 80 GSM non-woven fabric with removable 80 GSM non-woven fabric covered cardboard bottom holds box shape. Packets make 6 oz. of hot cocoa. 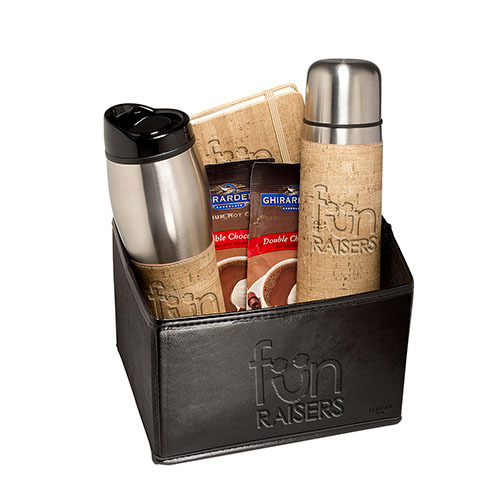 Make a big impression on prospective customers when you raffle off this great gift set! Inside of a Venezia (TM) folding bin sits two packets of Ghirardelli (R) premium hot cocoa mix and a 16.9 oz. stainless steel thermos with leak-proof cap that keeps drinks cold or hot for hours. A tumbler and a journal are also a part of this collection. 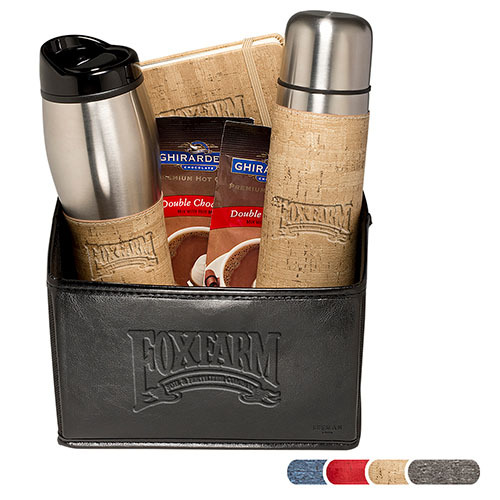 These three items are made by Casablanca (TM) and the two drink containers feature a cork textured sleeve with natural weathered look that removes for washing. Give clients what they want when you imprint your logo and give this out! Shrinkwrapped / 17 lbs lbs / 6 pcs pcs. / 14 x 18 x 16box. 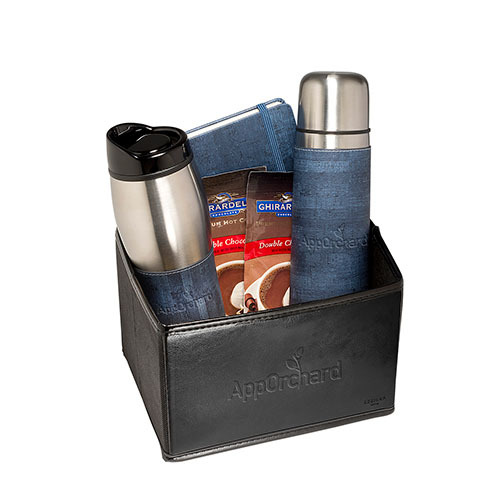 Imprint Area: Thermos:3.25" sq., Tumbler: 2.5"w x 2.25"h, Journal: 3.25"w x 3"h, Bin: 3.25" sq.